I hate the hype of Christmas! Holidays are such a lonely time. The commercialism of the holidays drills home the loneliness I feel. Perfect Norman Rockwell family portraits splashed everywhere – magazines, ads, and TV channels. Pictures of multi-generational families gathered together with large smiles, hugs, and joyous splendor. This is not my life. I don’t know about you, but I don’t want to go there this holiday season. I need support and prayers. I need you! We need each other. 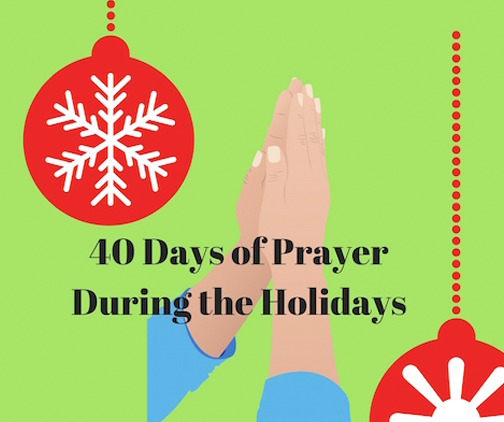 Will you join me in a 40-day Prayer Covenant to reach motherless daughters all over the world and fill that empty place in our hearts with each other’s love and prayers? You are not alone. There is a sisterhood of motherless daughters who stand with you and are holding you through this holiday season. “Dear Father, thank you for your grace that has made me one of your dearly loved children. Help me to know that you will fill those empty places with others who speak wisdom and truth to me. Empower me to love other motherless daughters the way you love me. Forgive me for my longing for those who are with you. Enable me to praise you, O Lord, with all my heart. Jesus, be Lord of my life today in new ways, and change me any way you want! Make me an instrument of your grace, truth, forgiveness, righteousness and justice. Fill me with your Holy Spirit. Use me today for your glory, and to reach motherless daughters all over the world and for them to know they are not alone. I pray in the name of Jesus. Amen. Share this and pass it on to others to pray around the world.